A roadtrip paved with good intentions isn't always a smooth ride. The last time Mr. Noodle and I went on a long holiday, my metabolism decided to take a break, too, leaving me at the mercy of an unforgiving all-you-can-eat hotel buffet. Two weeks and ten pounds later, I was back at home, unpleasantly plump and determined never to let vacation eating get the best of me again. So, when we recently loaded up the Big Maroon for an epic 17-day roadtrip through the western United States and knowing that our meals would be on the fly, I initiated The Plan [codename: Put Down the Donut]. On paper, it was a solid strategy, but like paper, it flew out the open car window once we put the pedal to the metal. And whatever comes our way . . . The desire to eat healthfully while on holiday ran straight into a favorite Noodle travel ritual - the Sharing of Cheesy, Crunchy Snacks. Early in our marriage, when our finances couldn't yet afford airfare to visit family out of state, my husband and I relied on roadtrips to take us where we needed to go. From North Carolina to Northern Virginia, from Charlotte to Chicago to Atlanta and countless treks in between, a full tank of gasoline and a package of faux-fromage fare were all the fuel we needed. At first, it was Planters Cheez Balls, which dusted the dashboard with Yellow#4 & Red#6 cheddar-ish powder and left bright orange fingerprints on the steering wheel. Nowadays, our meandering munchies of choice are the less messy but no less cheesy Pepperidge Farm Goldfish, beloved treat of stroller-bound tots everywhere and listed as #2 in Time magazine's Nine Kid Foods to Avoid. So, what's the appeal of this pre-school, post-industrial snack to a peripatetic couple in a much bigger carriage? In a bite, Goldfish are tasty little things. They dull the sharp edge of hunger and stave off cravings until we reach our destination for a 'real' meal. They're perfect for eating with one hand and driving with the other, but still allow for quick reaction when both appendages are needed on the wheel. And they're better than caffeine: when the hypnotic ribbon of road ahead lulls me into drowsiness, nothing else snaps me back to alertness than a burst of sharp processed cheese flavor and the sound of contented crunching. Although The Plan didn't factor Goldfish in its healthful criteria, that didn't stop us from indulging throughout our trip. I tried swapping them with rice crackers - equally tasty and crisp - but something was missing. They simply could not replicate the true value of the wee cheese fish, which have nothing to do with edibleness or nutrition and everything to do with sentiment. Goldfish have been our cue that it's time to relax and enjoy; the only time we buy these snacks is when we are traveling. Our vacation truly starts not when we pull out of the driveway or reach our destination, but when that white and orange package is opened and those smiling fish tumble out like pieces of gold. 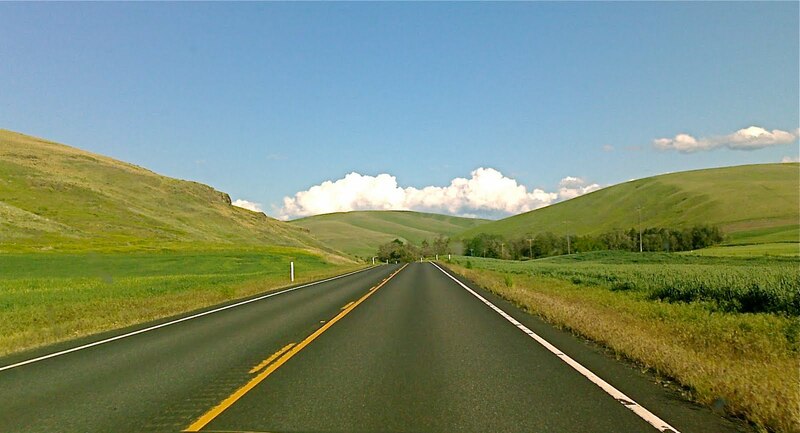 Then, emails, voicemails, bills and blogs are left behind and all that matters is what lays ahead - a delicate rainbow curving over the road after a Nebraska summer shower, moss-covered trees along the Columbia River Gorge or a massive butte jutting into a clear blue Arizona sky. Goldfish has been one of the special little things that Mr. Noodle and I share. When he neatly places a paper napkin on my lap as if it were the finest linen, then reaches under my arm - careful not to jostle as I steer - to shake out a handful of the crackers, I think that no tuxedo'ed waiter in the fanciest white-cloth restaurant could ever serve a finer meal. And when there's only a small handful left in the bag, we know that our next stop - our next adventure - is not far off. "Split?" he asks. "It's all yours," I say. There's plenty of Goldfish down the road . . . The Plan wasn't entirely abandoned during our trip - we picked up locally-produced foods at a couple of farmer's markets, co-ops and even a goat dairy, not to mention a variety of products that I brought home as edible souvenirs. So, I hope you'll join me in the next few weeks as I revisit some of the more memorable food adventures of our Wild West wanderings. Coming up first: North Platte Noodles, a roadtrip dinner do-over. I can't wait to hear all about your road trip! Fun! So this is why you were 'absent' from twitter. it sounds so fun. I love road trip like this, :) Tell us more! That sounds like fun! But I think the best part about a roadtrip is the snacking! The best laid plans... My 'healthy' eating on vacation ideas never work out right! But, Goldfish crackers sound less naughty than doughnuts. Can't wait to hear more about your trip! You are so creative with that map and goldfish! Cheeze Nips when I was little was my comfort sick and traveling food- my aunt made sure of that! I am still the same way today- hate buffets, we run the other way. Funny how when we go to Europe I do not have any trouble with eating, since- shhh! hard to believe, but I am a picky eater, and I want vegetables, green ones, or salad- its the sweets that get me in trouble! I can only survive so long with out cooking too??? Look forward to your adventures! I've missed you! Oyster said you were out visiting in SF but I didn't know you were taking this extensive roadtrip. Goldfish have certainly changed since they were in my lunchbox - what's with all the colors and the smartass smile they have now?! Did a lot of roadtrips in college and pepperidge farm was always along - in the form of goldfish and the giant soft baked chunk cookies. Oh, man if you were trying to institute "The Plan" does that mean pepperidge farm calories count in the car? I was hoping your magic dairy computer had an application that negated calories consumed while roadtripping! Glad your back and feel free to gush about what a wonderful place Oyster lives! My travel food: Cheez Doodles and a Yoohoo. It is my private--now public--shame and guilty pleasure! Hope you guys had a fantastic time on your trip. Looking forward to hearing all about it. PS Peripatetic is one of my favorite words. my road trip favorite is peanut butter stuffed pretzels. Car calories don't count (kind of like vacation money). Your trip sounds great! What a fun trip...look forward to more posts. Be safe! Will be hanging out to read all about the trip! Hi everyone! Thanks for you comments - I'm actually trying to finish up a post about our first night's dinner on the road. It's not quite a triumph of 'The Plan' as I'd envisioned, but once I got home, I had a second shot at it. Thanks to those who shared their preferred roadtrip munchies - it sounds as if 'crunchy' is the operative element in our choices. Nothing like loud sounds to keep us alert while driving . . . ! Come on - 10 pounds - don't believe it, unless something happened after you went through SF. We had so much fun during your all too brief stay here. Look forward to reading the details. My road food downfall is easy cheese, you know the kind in a spray can! This is just the cutest post I've read in a long time. And by cute, I don't mean silly... it's creative, well-written and funny! Oh, a goat dairy! That would be fun. Sounds like an nice trip and that last photo is gorgeous! Wonderful post! And wonderful spouse, I have to say. And I understand it all from the addiction to those tasty Goldfish (we grew up on them!) to the PLAN being diverted by a carful of snacks and, well, the car full of snacks. Just love it! And those goldfish are quite addictive! Gosh you should SEE what we ate on our French road trip last Christmas.... So much worse than goldfish! Oh, I have a special place in my heart (and tummy) for Goldfish! While Time may not like it, I admit that it's a weakness for my family (have you ever tried the Flavor Blasted? ), and I just try to rationalize that it's not Doritos, LOL. What a sweet post!